Once owned by a notorious 19th-century gunfighter, this Old West-style resort on a secluded cattle ranch is 10 miles from the rim of the Grand Canyon, 2 hours from Las Vegas, and 35 miles from Route 93. Featuring cowboy-themed decor such as wagon wheels and saddles, the custom-built pine cabins sleep 2 to 5 guests, and have porches, fireplaces or wood-burning stoves, and en suite bathrooms with showers or antique claw-foot tubs. Some cabins add loft bedrooms. Linens are provided. The Ranch also offers Glamping Tents, a fusion of glamour and camping, for those who want to experience camping without the hassles. The tents are fully furnished in western style decor. 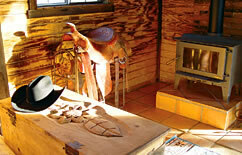 The Ranch also offers a Cowboy Campout for those who wish to saddle up a horse, and join the old tradition of the American cowboy on a guided overnight Campout. Nightly campfires offer live music. There's also a rustic restaurant and fully licensed bar. 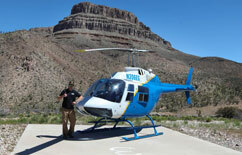 Guided horseback treks, wagon rides, a western gun range, and helicopter tours of the Grand Canyon are extra. 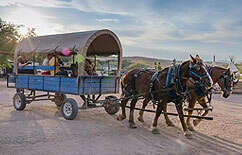 Horseback or wagon rides guided by a genuine cowboy through the rugged desert landscape. 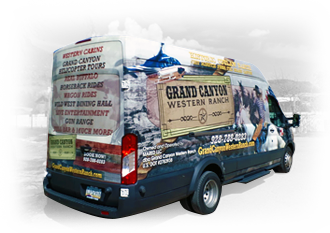 Grand Canyon Western Ranch is a historical ranch dating back to the early 1900's, and once owned by a notorious outlaw connected to the Hole in the Wall Gang. After your meal you can sit back, relax and enjoy Live Cowboy Entertainment in our famous "Diamond Bar" serving beer, wine and all your favorite cocktails. Transportation from the Las Vegas Strip! 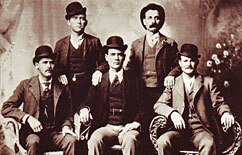 "Great for the whole family" Our family of my husband, myself and my 2 teenage boys spent 2 nights at the Grand Canyon Ranch and everyone had a great time. The evening horseback ride was a lot of fun. My son also had the opportunity to play the guitar with Casey during the campfire which made the trip worthwhile. The staff is incredibly hospitable and want you to have a good time. The ranch is reminiscent of vacations I would take as a child where you got time to spend with each other and not everyone going off in different directions and doing their own thing. We left with memories to last a lifetime. My kids still talk about it." "We spent a fantastic September evening at the Ranch. Tex and Cowboy Dave made our stay very memorable. I had not been on a horse for 35 years but it was a blast. The dinner and campfire events will live with me forever. Long live the Diamond Bar (as it should really be known as) If you want to get an idea of how it felt to ride in the wilderness go on the sunset ride. Brilliant." Sign up for FREE and receive information on specials, contests and area events.